Important: update your plugin. MailChimp® changes his API, and old versions will stop working soon. Note that new version needs a different installation/update procedure, please read details at "Installation" tab. Do you need a tool to make sure your MailChimp® list and your s2Member® (or OptimizeMember inside OptimizePress) list are synchronized? Do you want to make sure that any change by the user on his MailChimp® account is automatically changed in your s2Member® one too? Do you want to let users register through a MailChimp® sign up form and automatically be added to your s2Member® list? 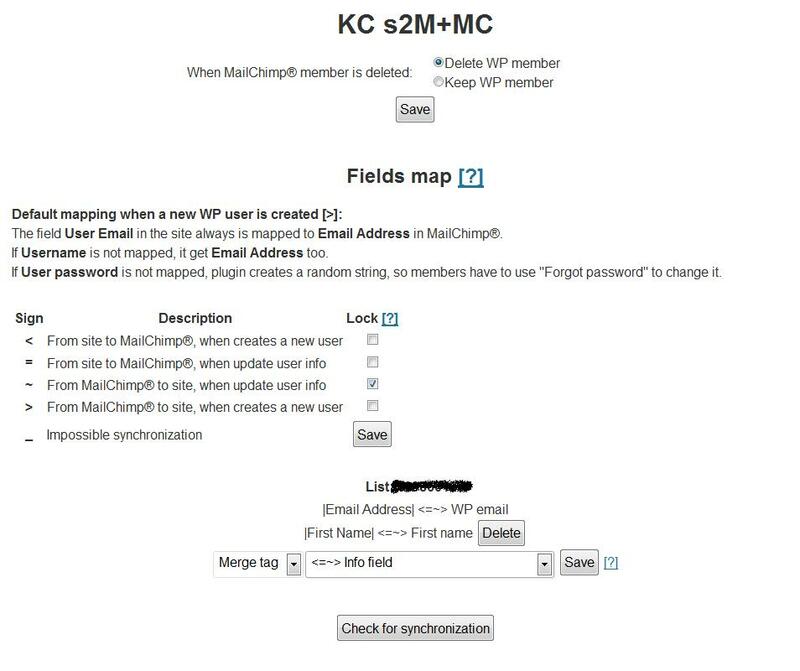 “KC bidirectional integration of s2Member® with MailChimp®” (or just “KC S2M+MC”) does exactly what it says, literally. You just have to set your MailChimp® account and fill the necessary fields in your s2Member® admin panel. Then install the KC S2M+MC plugin. It will keep your lists synchronized with your site’s members. S2Member® is a great plugin. MailChimp® is a great service too. But they can not “communicate” very well without this plugin. In fact, you would need to manually check and edit your lists to synchronize them, which is not effective and not fun at all. And missing one member or one user could mean loss of sales. This won’t be necessary any more. The plugin will also detect if you don’t have s2Member® installed or if you haven’t entered your MailChimp® API key, or did not set (or change) your lists, or if you reinstall s2Member® and so on. It monitors for your activity and when you have done all the proper settings, it will run and do its synchronizing jobs. Once installed, it is a silent and trustworthy worker. Another GREAT advantage of this plugin is that you can use the MailChimp® signup embed forms or link forms anywhere and it will still recognize that the list is associated with your s2Member® installation. It means you can use the embed code or the link code on a totally different site, in your signature in forums, or even in your emails, and it will still communicate with s2Member® and create an account there if a new member joins through your MailChimp® forms. A happy customer creates a video presentation for this plugin. Thanks, Cassel! The plugin cares only about the lists associated with your site. You can have more lists in your MailChimp® account, but they are not touched. When your member in MailChimp® list changes an email, plugin changes the email in site's account. Same thing for changes to the first and last name of the member. If a member unsubscribes from a list (but not delete), no emails will be send to that member, also account stay in your site. So if member changes his info in MailChimp® site, his account still will be updated too. If a member is deleted from the MailChimp® site, his account will be deleted in your site too, if it is not in other list(s) in MailChimp®, thus allowing better lists handling. Also saves your money: in MailChimp® duplicate entries count as separate members, and if one list has 500 names and another list has 200 duplicates of those, MC will count as if you have 700 names and will charge you for 700 (but, depend of your scenarion, you may need them this way). The Pro version also have a radiobutton to set behavior in deleting a member from MailChimp® list: you can choose to delete the member (default), or to keep it. If the mail box of the member, saved in the list, disappears, or is out of service or so, MailChimp® "cleans" that member automatically. The corresponding account in your site will be deleted too. Or not, depending of if the member stay in other lists, or (with Pro version) did you choose that. You also can re-set MailChimp® site or check synchronization manually, read more in section "Usage". Even when you change your lists (add more lists, remove lists etc), the plugin will "know" and will do what is needed, all automatically. WARNING: because of how powerful this plugin is, you have to also be careful: if you choose to move a user from one MailChimp® list to another, means that one user will be deleted and that can also delete the s2Member® account. This means that if you really need to move the user, you will have to recreate the MailChimp® account and the plugin will recreate it in s2M. 1 When members are added from the MailChimp® list to your site, they are always added with the "default role" which you set in "Settings->General" page, so it is best to set it as "subscribers" (or "s2Member_Level_0"), or there could be security issues. Note that synchronization of lists for other roles creates new mis-synchronization with the lists for "subscribers", so be careful. 2 Will not add a member from MailChimp® lists twice, even if the member is listed in two lists. Please read the manual. The video guide may be easer, but gets old with any next version, new version have new needs. With Pro version: you can look at settings, there is lot of possibilities, see bellow in screenshots. When you reach back our site, your username will be "*|EMAIL|*". There is no password we can give you, so once you will reach the log in screen for the first time on the [your site], click "Lost your password?" and you will be prompted to choose one that you can remember. You can set what to do plugin when a member is deleted/cleaned from MailChimp® list: can delete or keep user in the site. You can lock some (or all :-/ ) synchronization events. This makes it VERY flexible. You can set a "map" for each list, so each list can have his own set of "roads". Can create "roads" from "merge tags" in MailChimp® list to "WP account info" (standard profile fields), "s2Member® Profile Fields" (include ccaps*!) and even to "s2Member® Custom Profile Fields". Note, that map works with both directions, so if you change some mapped field of a member in your site, it will be changed in MailChimp® list too. Manual synchronization ("Synch it" and "Synch ALL" buttons) does a full synchronization - adds members to MC if there is missed, or from MC to WP, if there is extra. This is lot of work, so the page can load slowly, be patient. Also it is hard by different mean: for example, it is impossible for plugin to know if a member belongs to two different lists with two different emails, so it will save it to the site twice. There are many cases where problems can be hidden, so think before doing any manual synchronization, and check the result after. There is no way to get this done automatically. The plugin can not deal with situations like this: a member wants different emails with each your lists. In this case there can be several scenarios, like the member's email in the site will be the last set in MailChimp® site one, or there will be several members with different emails. Fortunately these are very rare cases. In the admin area page you will find a link to list with possible new features. You can add more features in this "wish list" and can vote for which one to be done first, while donating some bucks for faster development. * Note, that with Basic version ccaps are not "really synchronized". Means, change/add/remove of a ccap (by some purchase, for example) did not change it in MC, unless synchronization is forced by other change. This is because ccaps are s2Member feature only, and they are independent from anything, include by other ccaps. There is no good way to track ccaps I know, yet... But several "limited ways" exists, and can be added to the plugin (and some are already added in Pro version), so if you need that, let me know. We can find some solution. FAQs was moved to his own page. When s2Member® changes the user's level, like when demotes the member account at EOT, Mailchimp® is updated too. Means, if you choose to synchronize "user role", it will be synchronized just after the change, and you will have the real role in MC's merge tag. Additionally, the "Role" field now can be synchronized both by "system name" like "s2member_level1", or by your name you set in s2M's options like "Professional Member". Now in "Users" page you will have a new column "Lists", where will be shown each list where the user is subscribed. Well, if you not need it, just hide it by "Screen options" there. Can not sort users by this new column. But can filter them! There is two new links for each list, just under the system filters links: "in ListX" and "NOT in ListX". Means "all members in ListX" (where "ListX" is the list ID) and "all members NOT in ListX". It was an epic battle with WP and s2M to build them, hope they will do your life easier. But biggest update is that now plugin allows you to synchronize each ccap separately with a merge tag. And it's bi-directional! Means, this allows you to create a field in MC form and the plugin will set a ccap to member for you, automatically! Sure, you will get the merge updated if you delete the ccap from Admin area too. Or if member buy some ccap too. And so on, open your mind, there waits lot of useful possibilities! Note that such massive changes have some "bad sides"... You have to click "Check synchronization" button often. For example, sometimes people can be shown as "subscribed" in "Users" page, while they are not. So before you do some change of a member, related to lists, check synchronization first. Plugin fixes this bug in s2Members (already successfully fixed by s2M team). I urge you to update my plugin, to avoid unsubscribing/deleting of MC members. What is the problem: If you choose to set "agree" checkbox, to ensure that members know that they will be added to the list, that checkbox stay in member's profile too. And when member updates his info in WP, checkbox are left unchecked, which unsubscribes the member from the list... Also if member changes his email, s2M treats him as a new member for the MC list, and sends "new member" request, instead "change email", so member gets "confirm address" email from MC (where you set double opt-in) for the new email, and is deleted with his old address. Well, I was able to fix these problems in my plugin, except "confirm" email. EOT time can be mapped with 4 formats: "Unix timestamp", "pseudointeger YYYYMMDD", "plain English text" and "MailChimp safe MM/DD/YYY". Means, you can set a merge tag in the list and map the EOT to it, and use this info to "slice" the list for specific campaign. EOT days/weeks/months before/after expiration. Means, if you set "Days before/after EOT", and in a merge you have "12", this will means that after 12 days this member will be turned to free one. Can use this for (automated) reminders. Or, after the membership expires, member will have "-5", which means that his membership expires 5 days ago. Can use for (automated) followups. Can send standard WP welcome email with password when import new member from MC. Or not... Old versions had no way to send such email, and was no way to new members to know his password. Now is possible to set it to send "Welcome email" of WP (or edited in s2M) with the username and password, to the new members, created from MC members. When "Username" is "Email Address", can change "Username" when "Email Address" is changed. Means, now we ensure, that when we set username to be the user's email, it always will be, even the user (or you) change the email. Good for users - not need to remember that username is his old email. Shows the lists with missing members. Under the "Check for missing members" button you see messages, when some members don't exists in site or in MC list. Now the numbers there are links, which open a pop-up window with emails of missing members. This way you are able to search for them in your DB and in MC list, and can find why they are missing. So you can care better for your lists and site, as result. Allows to synchronize existing member's info. There is new buttons for each list and for all the lists together. Means, now the "Synch it" buttons care for "missing/new members" only. But if a member stay in both WP database and in the list, "Synch it" buttons will not touch it. Instead, these new buttons will update it, means will copy the user's info from/to WP database to/from MC list, when you need that. With old versions the only way was to save the user's profile, which can not be done at bulk. members. Well, all this means that lot of manual job can be saved, while allowing better list's and user's handling. Synchronization with setting at "s2Member Admin -> API / List Servers -> Registration / Double Opt-In Box?". Now the plugin reads what you set in s2Member's settings about double opt-in. And plugin can be even better. At "New features" page you can select (or suggest) another feature, the list is long. This way you can choose new features you would like to see included in the future Pro versions. Did you have some suggestions? What else you would like to have as features? You can see what others wants, can add your feature, and can vote which one to be done first at this page. "Your plugin is great.... I am cleaning out my MC list from members who have not opened an email in 6 months... And I know it will be updated in s2M! And I am so glad for that plugin myself. I got dozens of new members using the MC sign in form! It would have been so much work to do it manually, or require the users to register a second time, possibly with different information in s2M and MC.... And prevents errors or omissions. Your plugin does much more than those other paid plugins!" In the WordPress repository you can find the Free version of this plugin. Short explanation of license: Perpetual License with 12 Months Support. You buy "allowed domains" number (not installations, on one domain you can have several sites), with one year updates, bugfixes, training, installation help. When the year passes your plugin will works, if no significant changes in WordPress®, s2Member® and MailChimp®. Also you get lifetime discount for any other products of mine. Additionally, we will set discount for all new features you may need. Also I would like to share my revenue with you. Welcome to my Affiliate program. 1 15 USD You must log in or create account to purchase this product. This entry was posted in WordPress plugins, WP+s2M plugins and tagged bidirectional, bridge, email, integrate, integration, list, lists, mail, mail info, mailchimp, mailing list, mc, member, members, members info, s2m, s2member, synchronization, synchronize, tool, transparent. Bookmark the permalink. This plugin works great! It has saved me so much time in transitioning to a wp site. I use S2mPro and this plugin works great with it! On a side note, Krum had done several jobs for me. He has the “programmers magic” that you are looking for! Just a thank you message for synchronising my s2Members and my Mailchimp accounts with your plug in. Works brilliantly. My membership lists are now in perfect unison and either can be used for membership updates. Your help has been fantastic. The plug-in works great. There was some obstacles in my particular install, but everything was fixed after I email Krum about it. One question – would i need to disable the automatic list transition feature of s2m? No, users will not be moved to other lists. This week, i am running a promotion where customers can purchase 5 Master classes of their choice but they have to tell me so i can add the ccaps manually. 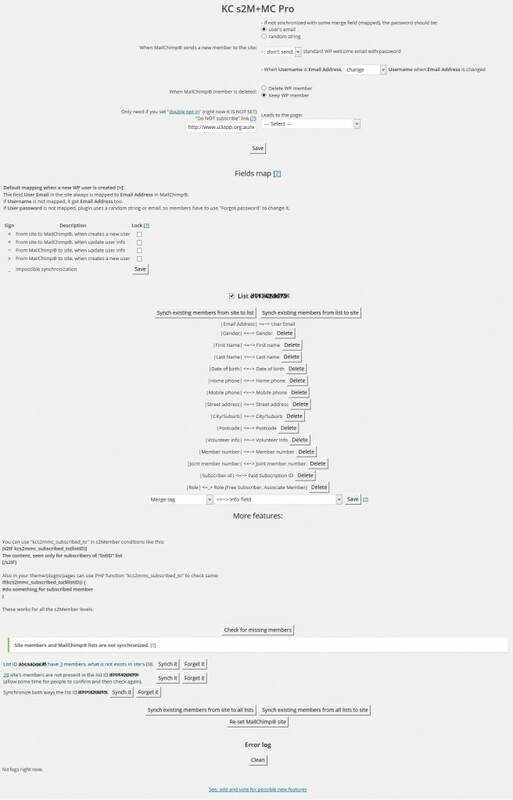 Tonight, i did add the 5 ccaps for one customer and as i went to copy them into MailChimp, they were already there! I thought your synchronization would only work with the actual transaction, but no… it works for ANY edit to the ccaps even if done manually. That is GREAT! I have not checked if it also synchronizes when ccaps are removed, but i LOVE this current set up. You did a fantastic job with that one! Does the merge tag/profile field syncing also sync custom profile fields added in s2Member and are there any limitations/rules about that feature? Or does it only allow for the basic WP profile fields? Both usual WP fields and s2Member’s custom fields are mapped. Plus some system fields, both in WP and s2Member. EOT, as example (in Pro version). Great plug-in by the way, saving me a ton of time. Question, with the pro-version. all is setup and syncs perfect after user update. Is there a way to force this update sync for old accounts in bulk without having to manually click update on each users profile? Nice to see that you liked my plugin. I am thinking about such feature too, if you like I can build it for you. Please contact me. Do I need to do any specific configurations for this to work seamlessly using the W3 Total Cache plug-in? No, this plugin is not related to any cache. But real problem is that W3 Total Cache plugin is not compatible with s2Members (as for now, I hope). Please read more info at this thread. This plugin is fantastic! For me it was a no brainer. I’m just a regular guy with literally no codding experience. I have no clue how to write code or even do CSS. Luckily with today’s technology, I don’t need to know this to still create a pretty good website. I created a website using the S2 Member plugin. Everything was going great with the plugin until I realized that there is no good way to keep my users data in sync with MailChimp. For some people out there, this might not be that big of a deal. If all you want is to get a members email address into MailChimp, then S2 is probably good enough. However, if you want to allow any email changes made on your site to stay in sync with MailChimp then this plugs in does the trick. Besides just email addresses, I have other profile fields on my website that I absolutely need to keep in sync with MailChimp. So for $30 I picked up the Pro version of this plugin, and in a matter of less than 60 seconds, I was able to get all my S2 custom fields in sync with MailChimp. So anytime a user logs into my site via my S2 Member plugin, they can update any of their profile fields and that information will sync with MailChimp. This was all done with a few clicks of a mouse, by using the S2+MC drop down items. Literally zero coding. 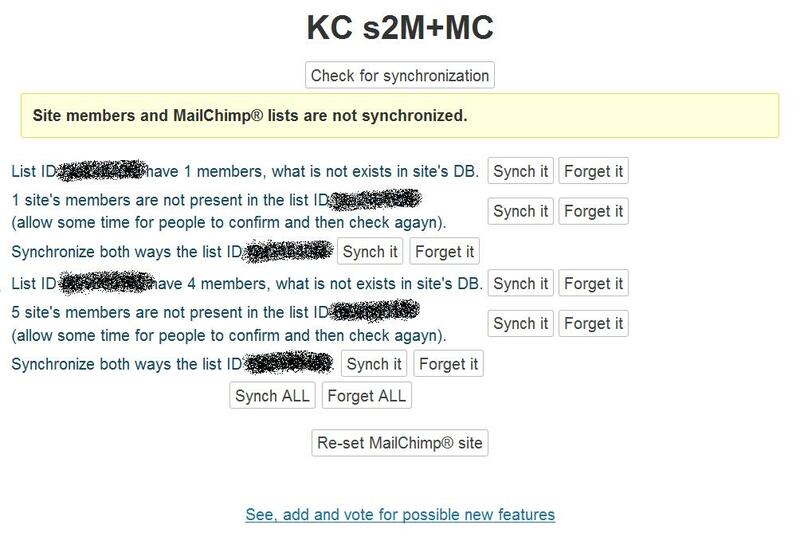 S2 Member was also adding in a new member into MailChimp every time a user was updating their email address. However, with this plug in, when a member makes an email change on my site, this is generating an “update email” request to MailChimp, not a “new member” request. Best few dollar I have ever spent. There is no way I could live without this plugin.